← How Do You Cope With Change? I may have shared this in the past, but I though t it was worth repeating. 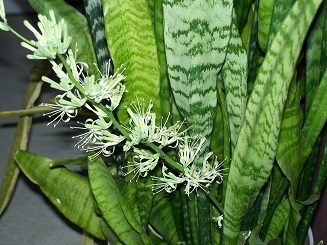 Did you know that the snake plant (a/k/a Sansevierias or Mother-in-Laws Tongue) blooms? Yes, it does. According to gardeningknowhow.com, although extremely rare, the plant will produce a flower stalk when it’s mildly and continually stressed. After three plus decades of carrying this one from place to place every time I moved, this root-bound snake plant bloomed. When I first saw it, I thought someone had put a sprig of some other flower in the pot. I couldn’t believe it bloomed! With a little bit of research, I found a rare event had occurred under my watch. Granted, neglect had contributed to the event since I hadn’t transplanted the plant for a long time, but that’s what it took to yield the blossoms. I really enjoyed the sight but felt a bit guilty that the plant was stressed, so I broke it up and got three nice-sized plants out of this one. The reduction in its stress meant I would no longer see the rare blossoms unless I neglect them for the next 30 years. But my conscience is clear. Though I probably won’t see another bloom for a while, isn’t it great to believe in the possibility? I think I’ll expand that belief to other areas of my life…I’ll believe in possibilities! What about you? This entry was posted in Inspiration, Nature, Simplicity, Spiritual Living and tagged Creativity, inspired living, Nature, Spiritual living. Bookmark the permalink. Sometimes when we are stuck in the same pot for too long and don’t get the attention we deserve, we may resort to our own devices and create our best and most beautiful self. Becoming aware of the possibilities within ourselves and in the world around helps us to flower.